Now we are getting into the higher measurements of what the Mayan elders have told me in our conversations in the last week of July. However, the magnitude of events in which they described will not occur until the last week of August. Not just earth changing events, but geo-political events which include the monetary shift away from the United States and continued escalation between Pakistan and India. The first X-class flare measuring X6.9 has set off from sunspot region 1263. 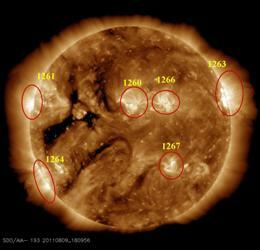 This region was just rotating around the western limb of the Sun and will only present a glancing blow to Earth. Region 1263 has become unstable and has increased in power. Just six hours prior to the X6.9 it produced an M2.5 which now adds to five M-class flares and today’s X6.9 during its rotation on the Earthside of the Sun. Magnetic flux alert thresholds where exceeded and a warning has been announced. This event was associated with a Type II burst (1550 km per second). 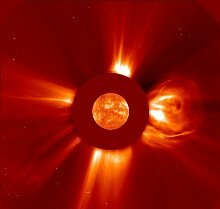 The data from solar satellite ‘STEREO’ confirms the presence of a CME (coronal mass ejection) at a speed larger than 1000 km per second. 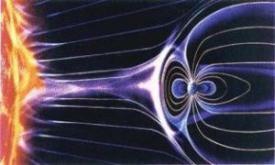 The arrival of charged particles to hit the Earth’s magnetic field will trigger a geo-magnetic storm within the next 72 hours. Watch for an escalation in earth changing events such as earthquakes, volcanoes, hurricanes, wind shears, straight-line winds, and extreme weather shifts. NOTE: As a result of the faster paced events unfolding, we feel a ‘measured’ presence of urgency is warranted. We have made another 25 scholarships available. We understand your frustration if scholarships are gone before your request registered. We believe the most fair method is ‘first come first severed’. But don’t give up …. the more memberships we acquire, the more scholarships we can make available. Watch for further announcements. This entry was posted in 2012, ancient text, asteroids, astrology, astronomy, comets, cycle 24, earth changes, earth’s core, earthchange, earthchanges, earthchangesmedia, earthquakes, extreme weather, floods, galactic center, galaxy, hopi prophecy, hurricanes, mayan prophecy, mitch battros, science, solar eclipse, solar flares, solar storm, space, space weather, sun-earth-connection, sunspots, tsunami, Uncategorized, universe, volcanoes, weather and tagged 2012, ancient text, astrology, astronomy, charged particles, coronal mass ejection, cycle 24, earth changes, earthchangesmedia, earthquakes, extreme weather, mayan prophecy, mitch battros, solar cycle 24, space, space weather, sunspots, volcanoes. Bookmark the permalink.